Dang, y'all. Are we really already in July? I can't complain much (it is my birth month, after all), but I can't believe how quickly summer is flying by. Before I know it, I'll be boxing up my sun dresses and breaking out the boots and scarves again. That's right around when I'll ask myself, not for the first time, why I chose to move from the Midwest to New England. Perhaps I'll pick more wisely next time. Happy Independence Day weekend to my American readers! May your days be filled with barbecue, booze and sunshine. On to the June lists! The Beautiful Bureaucrat by Helen Phillips (ARC) — Eerie and oh so readable! Look out for a review of this one in late July/early August. Bird Box by Josh Malerman — Solid backlist horror, though I wasn't impressed by the ending. The Wives of Los Alamos by TaraShea Nesbit — Quiet, atmospheric, and devastating are all words I'd use to describe this one about the wives of scientists involved in the Manhattan Project. Murder on the Orient Express by Agatha Christie — My second cozy by this juggernaut, and I liked it much more than my first. Are You There, God? It's Me, Margaret by Judy Blume — I revisited this old favorite for the #BlumeAlong and was surprised by what I did and didn't remember! The Girl with All the Gifts by M.R. Carey — I did this one as a buddy read with Katie from Bookish Tendencies and Emily from Backlist Books. We chatted on Thursday evening, and I hope to get a review up sometime next week! The short version: I loved it. Autobiography of Red by Anne Carson — Verse poetry for Books on the Nightstand bingo. I honestly don't feel knowledgeable enough about poetry or Greek mythology to review it, but I enjoyed the ride. I got a little personal and talked about using books as an escape from the sometimes harsh realities of life. I hosted a giveaway of Claudia Rankine's excellent poetry/prose collection Citizen after loving it myself and getting the chance to see her speak. Congratulations again to Heather of Bits n Books for winning! I shared the three most fascinating facts I learned from Johann Hari's Chasing the Scream: The First and Last Days of the War on Drugs, an A+ read from May. If you have any interest at all in the American drug war, I implore you (again) to pick this one up! I unveiled my Books on the Nightstand bingo card and asked you all how you mix up your own reading habits. I waxed poetic about reading Judy Blume as a young gal in honor of this summer's #BlumeAlong, hosted by Kerry at Entomology of a Bookworm. I helped initiate another #flashreadathon after building a library stack that could crush my cat. 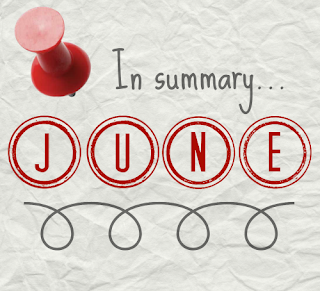 Two of my ten reads in June happened during the readathon, and I call that a success! As already mentioned, I got to see Claudia Rankine speak as part of New Haven's International Arts and Ideas Festival. She was warm, charismatic and a fantastic reader. I feel so fortunate to have seen her for free and gotten my copy of Citizen signed. If she comes to a place near you, make the trip! I've trained a batch of brand new interns in my lab. It was a hectic first couple of weeks, but they're self-sufficient (and so productive) at this point. I mostly make sure they have what they need and don't burn things down these days. I watched the Chicago Blackhawks win the Stanley Cup for the third time in six years! (From my couch, that is.) I love me some hockey and bearded men on skates, and I especially love the Hawks because, y'know, Chicago. At the behest of Trish from Love, Laughter and Insanity and with some encouragement from Cass of Queerly Seen, I ordered my first Stitch Fix box! (If you want to know more about Stitch Fix, Trish wrote a pretty good overview of the program and shared two of her boxes.) I ended up keeping three out of the five items they sent me and am well on my way to a capsule wardrobe. My boyfriend and I have reached the halfway mark in our A Game of Thrones read-aloud to each other. We're having so much fun with it, and I will definitely be posting about it soon. By the time you're reading this post, I'll be at 30,000 feet on my way to Oregon, probably reading something from my carry-on. I'm so thrilled (and lucky) to start off my month on vacation! Birthday, birthday! Expect photos of woodland celebration at the Oregon Country Fair when I return. More books, of course! Who do you take me for? Whew, that was longer than expected! How was your June? Are you mourning the loss or ready for a new month? Let's chat! I hope you have an amazing vacation - I'm so jealous and can't wait to see a million woodland creatures. Please bring me a fox. I'll do my best! At the very least, I'll bring back lots of photos of colorful hippies. Well happy birthday month and happy vacation! You'll be a little closer to me as I'll just be one state over in Idaho. Yay for hockey and yay for the Blackhawks. They aren't my number one, but I'll take it. (They're tied for my number 3 with Detroit. #1 and 2 are Pittsburgh and Toronto.) Have a super fantastic time at the fair!! So, thanks again for picking me to win Citizen. I read it over the weekend and there were some things that were pretty staggering to read. It’s sort of devoid and full of emotion at the same time. I think I need to read it a couple more times before I can formulate any truly coherent thoughts about it. But it is definitely amazing.